Today, Governor Brown signed SB 32, a historic climate law that will benefit all Californians by mandating reducing greenhouse gas emissions to 40 percent by 2030. This is the most aggressive action made by any state government to date to tackle climate change. Our climate is altering. It's clearly a huge deal. And despite some valiant efforts, society as a whole is probably not prepared. And this means that those less-well-off in our communities — our most vulnerable neighbors — will be even more susceptible to harm once the tangible impacts of climate change converge on this region. And that's why the work of Vien Truong is so crucial. The director of Oakland nonprofit Green For All, which was founded by CNN personality and author Van Jones, spends her days working to cultivate an equitable eco-friendly economy. Read the full article from the East Bay Express here. On the first anniversary of the Clean Power Plan, the Environmental Protection Agency will hold a public hearing in Chicago concerning its Clean Energy Incentive Program (CEIP). Part of the Clean Power Plan, the CEIP is a program that helps states meet their Clean Power Plan goals while encouraging low-income access to clean, renewable energy and energy efficiency programs. "We applaud the EPA for hosting conversations on the Clean Power Plan and to hear from community members ways to improve the Clean Energy Incentive Program. Programs like the CEIP will invest in communities on the frontlines of the climate crisis. The CEIP can help reduce pollution in heavily burdened communities by limiting investments to projects that need the incentives to be deployed. An East Bay woman is one of 10 people from across the country who will be recognized by the White House Friday for helping low-income and underserved communities prepare for and adapt to a changing climate. Vien Truong of Oakland will be named a White House Champion of Change for Climate Equity for her work to end environmental racism and empower communities of color to join in the fight against climate change. Truong was drawn to her current line of work after moving to the United States from war-torn Vietnam with her family, only to have her parents end up working as strawberry pickers in pesticide-ridden fields in Oregon, then at sweatshops in one of Oakland’s poorest and most polluted communities — where Truong ultimately grew up as the youngest of 11 siblings. Truong is the director of Green for All, an Oakland nonprofit organization dedicated to creating an inclusive green economy strong enough to lift people out of poverty. She lives in the city and has twin 3-year-old sons. Truong may be known best for past efforts of expediting California’s transition to electric vehicles through the Charge Ahead Initiative and developing strong environmental-technology workforce standards through the California Climate Credit. She also has developed more than a dozen state policies, created energy and workforce programs, and advised public investments for energy and community development programs. One of Truong’s most notable accomplishments was contributing to the passing of SB535, which in addition to reducing greenhouse gas emissions, redirected money paid by polluters to disadvantaged communities. In the past two years, that fund has directed more than $900 million to the poorest and most polluted communities in California, according to Green for All. The Champions of Change program was created as an opportunity for the White House to honor individuals doing work to empower and inspire members of their communities. White House officials selected award winners based on their work with low-income people in underserved communities. Truong will be honored with nine others at the White House Friday, in a program that will feature remarks by Christy Goldfuss, managing director of the Council on Environmental Quality, and John Holdren, policy director for the White House Office of Science and Technology. The event will be live-streamed on the White House website Friday at 11:30 a.m.
Read the San Francisco Chronicle article here. On Friday July 15th, Vien Truong will be honored with the White House Champions of Change for Climate Equity Award for her work to end environmental racism and empower communities of color to join the fight against climate change. Truong is the Director of Green For All, a non-profit organization dedicated to creating an inclusive green economy strong enough to lift people out of poverty. Truong grew up the youngest of 11 kids to a refugee family that fled from war torn Vietnam. Her parents worked in the pesticide ridden fields of Oregon picking strawberries. Later they worked at sweatshops, where she grew up in the heavily polluted region of Oakland, California, known as the “toxic triangle.” It is through these life experiences that Truong grew to understand the inequality and marginalization endured by disadvantaged communities. “Winning this award is a great honor, and validates all the work we are doing to end environmental racism and prioritize solutions in frontline communities that are hit first and worst by pollution and climate change,” said Truong. One of her landmark accomplishments is the passing of Senate Bill 535, a community reinvestment bill in California that created a polluters pay fund, which created the largest fund in history for low income communities to green up and to create economic revitalization for residents. In the last two years, it has directed over $900 million into the poorest and most polluted communities in California. “I’m privileged to be leading Green For All to create national programs that will prioritize low income communities and communities of color in the crafting of policy across the country,” said Truong. The award comes as Truong continues to lead in climate equity efforts in collaboration with a coalition called the Clean Power for All Collaborative, which is mobilizing to make sure that the EPA’s first national initiative to regulate greenhouse gases is used as an opportunity to clean up and reinvest in polluted communities. Rev. Ambrose Carroll, co-founder Green for All’s Green the Church movement, standing at the pulpit. The Green the Church movement is teaming up with spiritual leaders to engage churches and other houses of worship in the climate fight. African American churches have been on the frontlines of the most important social movements of the last century. The movements begin at the pulpit, with preachers stirring their congregation to action via Sunday sermons that link spirituality and faith to a greater calling. “The bible has a call for stewardship and a call to action—there’s a hook around sustainability,” says Julian McQueen, Green for All’s director of education and outreach. Green for All’s Green the Church is commonly referred to as a movement, with founders McQueen and Rev. Ambrose Carroll saying it is bigger than just a program – it is a force on climate action. When McQueen joined Green for All in 2008 on the organization’s 28th day of existence, he felt a calling to engage local community leaders and youth in protecting the environment. Now, serving as Green for All’s director of education and outreach, he has found success by creating Green for All’s All Fellowship program, which helps fellows develop skills to build community-generated solutions and organize in their cities. He’s also spearheaded the organization’s College Ambassadors Program, which supports the leadership development of students at historically black colleges and universities. It was at Green for All some years later that he teamed up with Rev. Carroll, formerly a fellow, to pinpoint how they could move the African American church to engage in the climate fight. In November 2014, the early stages of what is now known as Green the Church was born to grow sustainability programs and practices across the United States. To goal was to create a massive coalition of 1,000 faith partners across the country to share the need for conservation and preservation while seeking climate justice for disproportionately impacted communities. “As we went to friends, brothers and sisters in the clergy and in the congregations, they wanted to show that this global issue was our issue,” says McQueen. Carroll, a native of Oakland, California, is passionate about serving inner city communities and had been looking for a way to draw from his faith to spotlight global warming’s effects. He is working to engage with communities around how to reduce their carbon footprint and activate other tools to prevent environmental damage. Green the Church is close to having 400 churches in 28 states represented as of June 2016. It’s focusing its efforts on states engaged in work around both the Clean Power Plan, which sets a national limit on carbon pollution produced from power plants, and the “Polluters Pay Fund,” a campaign push by Green for All to make polluters pay to clean up their own toxic messes. Gaining momentum to grow the houses of worship involved in the climate movement is not easy, but it is having a domino effect. The national Green the Church program is a partnership between the grassroots organization’s parent, Green for All, in addition to churches and the U.S. Green Building Council. While not all churches and congregation properties have the resources to be LEED-certified, the council is sharing strategies on how to make places of worship, church centers and related facilities more sustainable. Heading into its second year this fall, Green the Church is ramping up its engagement efforts so that churches have partners and allies within the state to support each other. The support and dissemination of information is all encompassing, with guidance and educational tools on how communities can take action on environmental issues. In August 2015, Green the Church hosted its first three-day summit in Chicago at Trinity United Church of Christ, which is also President Obama’s home church. This summer, Green the Church is hosting faith-based trainings with clergy and leadership across the country. Among the topics is a candid discussion of how communities of color can best align and develop strategies to influence environmental solutions. The group will descend upon the Baltimore, Maryland, region October 25 to 27 to host a summit with an expected 1,000 church leaders. The primary target for training has been church leadership—starting with pastor level leadership to reach the congregation from the top down. In addition to being active in the Green the Church movement, Carroll is pushing back on a proposed coal terminal in Oakland. Carroll believes there is a need for organizations of all sizes from grassroots to grasstops (for example, large NGOs) to work together and go beyond the labels of environmentalist, conservationist and others to define their commitment to saving the planet. Both McQueen and Carroll are thought partners, armed with faith and passion for service to their communities with the hope of continuing to bridge a gap between the faith and environmental communities who want to create change. They and the thousands they have signed on to the journey are guided by a moral imperative to protect the earth, but they do not define their relationship with the earth in the same ways as others. Vien Truong gave remarks and answered questions on June 17th at the Democratic Platform Drafting Hearing of the 2016 Democratic National Convention in Phoenix. Afeni Shakur, the civil rights activist and former Black Panther, successfully overcame drug addiction to become of the country’s most heralded mothers. Her strength and life story inspired the work of her son, Tupac Shakur. His song “Dear Mama” remains the unofficial hip hop anthem on Mother’s Day. The song still makes me tear up thinking about the struggles moms go through for their kids — the sacrifices my own mom made for us. After Tupac’s death, Afeni continued shaping lives by running her son’s estate and helped to shape his legacy. She led investments to communities and charities through the Tupac Amaru Shakur Foundation. Twenty years after the death of her son, Afeni passed away this week. On Mother’s Day, I’m celebrating Afeni and the mothers like her who are fighting injustices to improve the lives for their children and the next generation. Like the mothers of Flint. I’m celebrating Desiree Dual, a mother and Flint resident that I met while touring the city with Green For All, the environmental justice non-profit that I lead. Desiree watched her children getting progressively sick from lead poisoning for months, and then one day stepped out of the shower to find blood coming out of her ears. Now, she’s spending her time organizing water deliveries for local residents and fighting for the resources for her pipes to be fixed as a member of Flint Rising — all while taking care of her sick children and her own health. My own mom was pregnant with me when escaping a war-torn Vietnam. We grew up in some of the poorest and most polluted communities in Oakland. When we finally settled down, it was in a neighborhood called “Murda Dubs” — appropriately named because it had some of the highest murders in the country during the mid-90s. Our neighbors were struggling to make ends meet for basic needs. 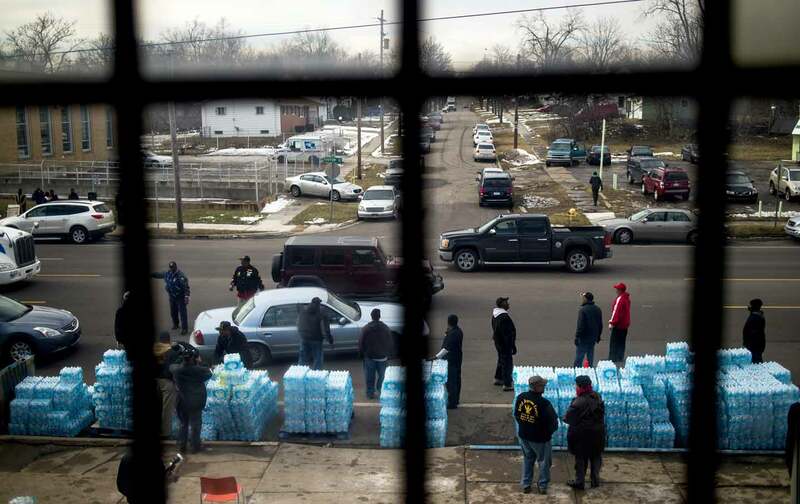 The struggle of Flint’s mothers strikes painfully close to home. I am now a mother of twin toddlers. We live in Oakland, in a community where residents are projected to live twelve years shorter than more affluent zip codes a few miles away. I grew up watching my parents struggle with many of the same environmental racism as Melissa and Desiree, and now I fight alongside them in Oakland. Several years ago, my husband and I teamed up with other parents to found the Roses of Concrete School in East Oakland. The school was named after Tupac’s poem “The Rose That Grew from Concrete.” The song celebrates the tenacity of youth who reach for the sun despite growing up in a community with little resources. As I reflect on my mom’s sacrifices, and try to have a modicum of Afeni’s tenacity and the strength of Flint’s mothers, I know that there is nothing stronger than a mother’s resolve to fight for our kids. Let’s make sure that we are constantly celebrating the mothers that are carrying the water for this activism daily, and remember that we owe it to our kids to create a sustainable legacy. Short clip of Vien Truong's personal story of why she works on the environment. Vien is one of the most passionate and effective environmental justice leaders in the country. She is the Director of Green For All which is working to develop a green economy strong enough to lift people out of poverty. To watch the full video go here: storiesarepower.com. When Tony Palladeno Jr. started buying and refurbishing houses on the east side of Flint, Michigan, 25 years ago, they seemed like a good investment. The houses are on what he described as “primo land” near a community college and a park, and he figured there would always be a stream of student renters. He hoped the extra income would provide a cushion for his wife, who doesn’t have health insurance, in case of medical emergencies. Instead, Palladeno’s houses have become a crushing financial burden. The trouble started in 2006, when Palladeno lost his job at the local newspaper, and fell behind on property taxes. Then the Great Recession walloped the city, hastening what had been a steady decline in manufacturing jobs. Property values plunged. They were finally starting to creep up again in some neighborhoods when lead poisoning in the city’s water—which began two years ago this week, when the city switched to the Flint river for its water source—became a national scandal. All of the property in Flint combined is now worth some $500 million less than it was before the recession, according to NBC. That’s left many residents trapped in homes they can’t sell. Not many people are eager to move into a city with poisoned water, and even if there were buyers, lenders won’t finance mortgages unless sellers can prove they have potable water. Few residents have the money to simply walk away. Some are even facing higher property taxes this year, because of the slight uptick in value before the extent of lead contamination was widely understood. To make their homes habitable, residents have to repair what the contaminated water destroyed: pipes, hot water heaters, dishwashers, and other appliances. The necessary repairs will cost at least $4,000 per house, on average—an impossible sum for many Flint residents, 42 percent of whom live below the poverty line. Even if every dollar of the pledged recovery money ($28 million from the state and $85 million from the federal government) were handed out to residents, it would leave them short. Even more devastating may be what the water crisis has done to residents’ wealth. Flint’s population, which is 57 percent black, is particularly vulnerable to downward swings in the housing market. Nationally, home equity accounts for a staggering 92 percent of black Americans’ net worth, according to the Center for Global Policy Solutions, while whites tend to have more diversified investments. Maya Rockeymore, the group’s president and CEO, says that Flint’s black population is likely to be similarly dependent on property values. Though they didn’t have much to begin with, the corrosion and resulting lead poisoning “literally stripped what little wealth the people of Flint had in their properties,” Rockeymore says. And it dimmed any prospect of recovery from the housing crisis. “We are seeing in real time how the racial wealth gap is created and perpetuated in contemporary America,” she says. In February, Rockeymore and other experts on building wealth in communities of color sent a letter to Michigan Governor Rick Snyder, arguing that “in addition to damaging the health of Flint residents, we contend that your Administration’s actions have also undermined their potential for maximizing earnings and accumulating wealth over a lifetime, which has a direct impact on the social and economic viability of the communities in which they reside.” Their point was that a proportional response required more than fixing the city’s water infrastructure and providing healthcare to the people impacted by the lead poisoning and other contaminants. (Or prosecuting a few low-level officials.) Among other things, the letter called on the governor to establish a fund to compensate residents for “long-term psychosocial and socioeconomic effects,” and for relieving homeowners of debt and tax liability on affected properties. There is precedent for compensation funds, notably the $7 billion fund set up for 5,562 people who lost family members in the September 11 attacks. But Michigan’s political leaders have expressed little interest so far. “We were very responsive to the victims of 9/11, and yet we’re seeing a slower and indifferent response of the victims in the Flint crisis,” says Rockeymore. Race and class bias may account for the disproportionate reaction, she suggested, likening Flint to Hurricane Katrina. 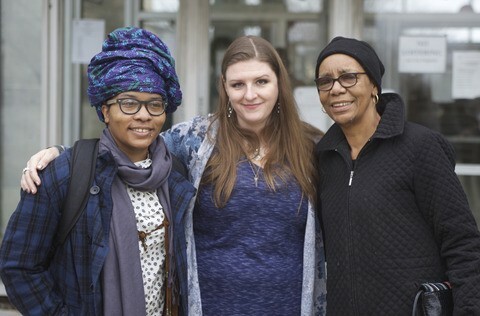 Green For All, a nonprofit working to center people of color in the climate movement, recently proposed a way for Michigan to finance a compensation fund. Under the Obama administration’s Clean Power Plan, the state could draft a plan for reducing carbon pollution that requires polluters to pay for their emissions, with that money going to a “Polluters Pay Fund” that would be invested in communities most impacted by environmental damage. Green For All will push for funds in a number of states, but chose to launch its campaign last week in Flint with a specific reference to the “huge amounts of wealth” local residents have lost because of the water crisis. The federal government and entities like the Federal Housing Administration, Fannie Mae, and Freddie Mac should help stabilize the housing market, too, said Aracely Panameño, the director of Latino Affairs at the Center for Responsible Lending, by encouraging lenders to allow Flint homeowners to refinance their mortgages and write off the cost of repairs. “No amount of money can take away the harm that the children have suffered, and the adults too.… Having said that, you compromise the opportunity they do have if they are locked into their property and unable to move out of the city for whatever reason,” she said.